Romania won the inaugural 3000m in 1984 (see “most memorable races” below) and looked like they might defend the title through Paula Ivan in 1988 in Seoul, but a 59.4-second last lap from 1987 world champion Tatyana Samolenko saw the Soviets win gold in 8:26.53, which was just outside the world record, with Ivan second. The 10,000m made its debut in Seoul and that also resulted in a Soviet victory. World record-holder and world champion Ingrid Kristiansen had been the favourite but had suffered a miscarriage in the summer. She nevertheless won her heat but damaged her foot and had to drop out after six laps of the final. Olga Bondarenko won with a strong last lap. Samolenko, under her married name Dorovskikh, defended her world 3000m title in 1991 but was surprisingly outkicked by her Soviet team-mate Yelena Romanova in Barcelona in 1992 in the last final over seven and a half laps. She failed a drugs test the following year. The 10,000m turned out to be a duel between Elana Meyer, who was South Africa’s best medal hope in their long-awaited return to competition, and Ethiopian Derartu Tulu. Meyer set a fast pace but couldn’t shake off Tulu, who then sped to a 65-second last lap to win by five seconds. Tulu and Meyer, South Africa’s first medallist for 32 years after the apartheid-related ban, famously shared a lap of honour. Wang Junxia, who had set still-standing world records at 3000m and 10,000m in 1993, was one of the favourites for the inaugural and poorly timetabled 5000m in Atlanta. She easily won a forgettable race in which Roberta Brunet won a medal seven seconds down on the Chinese as better-known names suffered. In the 10,000m, Wang appeared to have the double sewn up as she sprinted 15 meters clear with 600 metres to go. She had won all her previous 13 10,000m races and it was a surprise when 1995 world champion Fernando Ribeiro closed the gap on the last lap and then went past 50 metres from the end. In the Atlanta 5000m, the 1995 world champion Sonia O’Sullivan had been ill and dropped out but she was back in Sydney and had a great battle with 1997 and 1999 world champion Gabriela Szabo. She tried to pass the Romanian throughout the last lap, but Szabo repeatedly held her off and won by two metres. O’Sullivan had the consolation of winning Ireland’s first women’s track medal as Szabo set the current Olympic record of 14:40.79. In the Sydney 2000, Paula Radcliffe set a furious pace with a 15:05.07 halfway time but couldn’t shake off four runners and, on the last lap, Tulu, who had been fourth in 1996, sprinted a 60 last lap to win by more than five seconds from team-mate and world champion Gete Wami and Ribeiro. Ethiopia was expected to dominate the Athens 2004 race with a team so strong that world champion Berhane Adere did not even make their trio. Ejegayehu Dibaba, the older sister of Tirunesh and Genzebe, won her battle with Tulu and Worknesh Kidane on the last lap and started wildly celebrating, strangely believing that young Chinese runner Xing Huina, who had passed her down the straight was a lapped runner. In the 5000m, the middle laps were very fast and the then-little known 20 year-old Defar held on to Kenyan Isabella Ochichi’s driving pace and then sprinted past easily as world champion Tirunesh Dibaba finished third. In Beijing in 2008 in the 10,000m, Turkey’s former Ethiopian Elvan Abeylegesse forced a furious pace, but Dibaba nevertheless eased past with a 60-second last lap and 2:48 final kilometre as she went to second all-time with an Olympic record 29:54.66. The runner-up ran 29:56.34 to go to third all-time. In the 5000m in China, the Turk again forced the pace through the final kilometre but again Dibaba won easily – this time courtesy of a stunning 2:03 final 800m and 59-second last lap. Abeylegesse again took silver with Defar a well-beaten third. The 5000m in London in 2012 was a modest affair for 3400 metres with Briton Pavey leading much of it. Dibaba livened it up with successive laps of 68.95, 68.56 and 65.12, but she couldn’t stop Defar and Cheruiyot sprinting past in the last 100 metres. Defar covered the last lap inside 60 seconds and the last mile in 4:23, when the fastest mile of 2012 in a mile race was just 4:26.76! 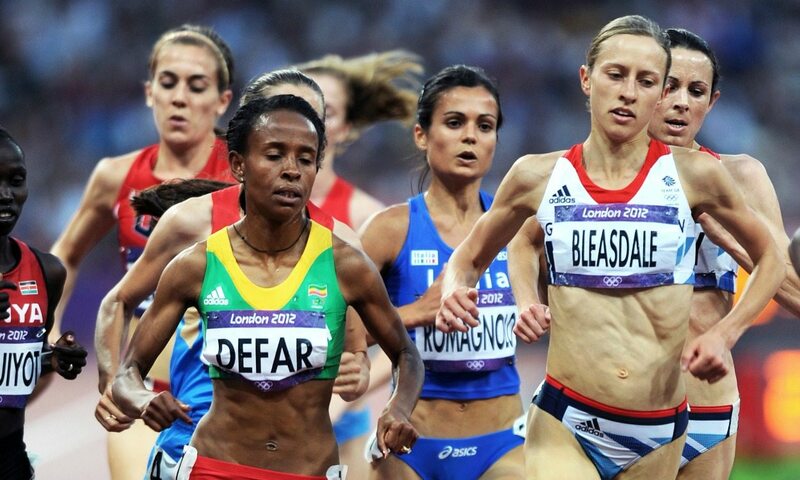 Dibaba was possibly affected by her earlier 10,000m effort and an extravagant 5000m heat. In the longer race, she had taken 10 seconds out of bronze medallist Cheruiyot over the last 500 metres and five off Sally Kipyego. It seems ludicrous now, but the longest women’s event in the 1980 Olympics was the 1500m. The inaugural World Championships in 1983 saw the first major global 3000 metres, though it had debuted in the 1974 Europeans and 1978 Commonwealths. In Helsinki, Mary Decker had won a wildly acclaimed 1500m and 3000m double and so started as a big favourite for the first Olympics in Los Angeles in 1984 in front of a partisan home crowd. The media suggested her biggest challenge might come from 18-year-old Zola Budd, who had broken the world 5000m record and then had controversially moved from South Africa, which was banned by the IAAF, to claim British citizenship by virtue of her grandfather’s nationality. The barefoot Budd was never going to challenge Decker at such a short distance. She overtook the American after 1600 metres but didn’t go entirely past. Running on the outside of lane one, Decker remained half a stride behind her on the inside. They had a minor clash and Budd stumbled slightly, but a few strides later they clashed again. Decker caught Budd’s heel and fell heavily into the infield, damaged a hip muscle on landing and was unable to rejoin the race. Budd, plus mile world record-holder and world cross-country champion Maricica Puica and Britain’s Wendy Sly, were left well clear of the field as a stunned American crowd started booing. Upset by being involved in her idol’s fall, Budd ran out of steam 500 metres from home as Sly and Puica pushed on. Puica went clear on the last lap to win in 8:35.96, with Sly a clear second. Budd went from third to seventh in the last 200 metres as she jogged in. She was initially disqualified but reinstated when officials decided both athletes were equally at fault. Decker, who returned in 1985 to break the world mile record, led the Olympic race in Seoul 1988 at near world record pace but faded over the second half to finish 10th. Britain started well with a silver for Wendy Sly in the 3000m in Los Angeles and then won two more medals in 1988. In Seoul, Liz McColgan tried everything in the 10,000m but couldn’t shake off the diminutive Olga Bondarenko and had to settle for a brave second as the Soviet women sprinted away on the last lap. Fellow Scot Yvonne Murray made a bold move in the 3000m final in Korea from 450m out but was overtaken on the last lap, although she held on for third in 8:29.02 with Sly seventh in a faster time than she had run in Los Angeles four years earlier. In Barcelona in 1992 Murray tried similar tactics, going 600 metres out, but she faded badly to eighth. In the 10,000m, McColgan as world champion was the favourite, but her pacemaking didn’t have the same effect as in Tokyo and she finished fifth. That place was matched by Paula Radcliffe in the inaugural 5000m in Atlanta, which was a modest-quality event. Had Radcliffe been in the same shape as in Sydney, she would have surely have made the podium. In Australia she ran the 10,000m and led most of the race at a searing pace, but despite her British record 30:26.97, three runners were faster on the last lap and she finished a disappointed fourth. It was arguably the greatest ever non-medal-winning performance in any event by a British athlete. Jo Pavey was fifth in the Athens 5000m in 2004 and then the leading European in both the 5000m and 10,000m in London where she was seventh, a place up on Julia Bleasdale in both.